One of my favorite Upworthy videos shows health foodies Michael Pollan and Michael Moss cruising the aisles of a supermarket and analyzing which foods are best and worst. What they find in the yogurt section is shocking. 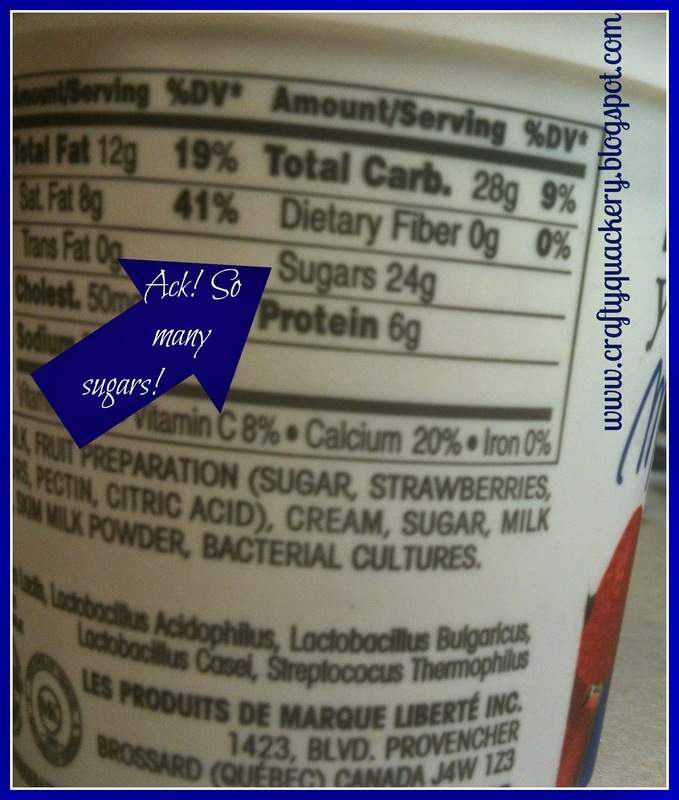 Many of the so-called healthy yogurt products are filled with sugar. After picking up a popular probiotic yogurt and reading the label, one of the Michaels turns to the other and says, "This has more sugar in it than Coca-Cola." Being a life-long nutrition label reader, that didn't surprise me at all. What does surprise me is how many well meaning people at work and elsewhere assume they are eating healthy when they eat yogurt. Even worse, they sometimes add granola or other healthy sounding food and compound the mistake. Of course, you can buy unsweetened yogurt and add your own blueberries or chopped fruit. But either many people don't know this, or they prefer the convenience of pre-added fruit. Toward the end of the video, one of the Michaels says a yogurt manufacturer confided to him if they don't add as much sugar to their products as their competitors, they lose market share. The point is, many foods have unfounded reputations. Muffins are just cake masquerading as breakfast food. Would you eat a piece of chocolate cake for breakfast? Okay, maybe you would. But at least you would know you were going to the dark side. Like those people who wear glasses to look more intelligent, many yogurts have become little more than pudding with a superiority complex. So just buy the unsweetened and add your own fruit. With the three new Flavors of Home microwavable Lean & Green meals in a pouch, Medifast could be treading dangerously into Nutrisystem and Jenny Craig territory. One major difference between Medifast and these other diet programs is that Medifast has always required participants to prepare or purchase one meal per day that meets specific amounts of lean protein, veggies and fats. Though the five replacement meals are no-brainers, you actually have to think about and plan your Lean & Green. For me, learning to create the L&G meals was a helpful tool in creating new habits I still maintain. Medifast is promoting the Flavors of Home meals -- Turkey Meatball Marinara, Chicken with Rice & Vegetables and Chicken Cacciatore -- as occasional back-ups for those busy days when it might be otherwise difficult to comply with the plan. And I'm totally cool with that. My concern is that some people may rely too heavily on the pre-packaged meals and never learn how to construct the Lean & Green meal on their own. Since I'm all about easy and convenient, I'm glad this option was not available when I lost my 35 pounds with Medifast. I personally may have taken the easy path and not forced myself to prepare or purchase the meals on my own. As with most things, the bottom line is moderation. You can drink a glass of wine without becoming a wino on Skid Row. If you're new to Medifast, consider using the Flavors of Home meals as infrequent emergency meals and allow yourself to develop the skills and habits you'll need to be a life-long loser. Sorry Medifast. 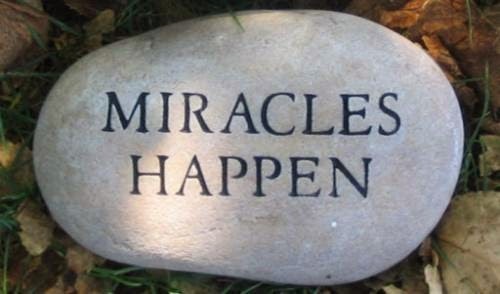 Even though your ads insist you are not a miracle, I beg to differ. Six months from the day I started the Medifast diet, I am maintaining my ideal weight. And now I know the secrets for staying svelte. I started this blog on September 29th, my first official day on Medifast. At the time, I was more than a little skeptical I could ditch my middle-aged pounds with yet another diet. And even if I was lucky enough to lose them, my daughter warned me I would gain them right back. I am happy to announce we were both wrong. It took me less than four months to lose 35 pounds, and I have not gained back an ounce since. Medifast has taught me new habits of eating and thinking that all but guarantee my unwanted pounds will not return. I always knew that drinking a lot of water was important for weight loss, but I had never gotten myself into the habit. Now I am never without a water source by my side. Water not only helps me flush out fat, it also keeps me feeling more full since I do not mistake thirst for hunger. Eating frequent small meals helps me eat less in the long run. I am not ravenous during meals so I can eat smaller portions without feeling like I am depriving myself. At restaurants I almost always go home with a to-go box or share an entree with someone else. Just knowing that I can eat more a little later makes it easier for me to put down the fork when I feel full. Between meetings, the break room and team potlucks, my workplace is loaded with food temptations. A cupcake here, a bagel there -- these bonus calories can add up fast. Before Medifast, I viewed such opportunities as an excuse to eat something I would not have otherwise gone out and purchased myself. Now I realize these "opportunities" will always be there so I keep substitute snacks at the ready that are just as satisfying and will not force me to shop in the plus-sized department. Move over Lean Cuisine. Medifast announced last week it is launching a new line of prepared Lean & Green meals that could conquer the biggest obstacle to complying with the popular diet plan. Taking the guess work -- and work! -- out of preparing the "1" meal in the 5&1 plan, Medifast announced each heat-and-eat meal has "the perfect portions of lean protein, vegetables, and healthy fat." The first three entrees in the Medifast Flavors of Home line will be Turkey Meatball Marinara, Chicken with Rice & Vegetables, and Chicken Cacciatore. Since I haven't tasted these meals yet, the jury is still out on whether they will be a hit or miss. But the concept itself is genius. further away from its shake-y past. These FoH meals are the perfect solution for those busy days when I cannot prepare my own Lean & Green meal. My typical work day starts at 1 o'clock in the afternoon; so when I was on the weight loss phase of the plan I had to either bring a salad or prepared meal from home for dinner -- or find a takeout meal that approximated the correct ratio of proteins, veggies and fats. Occasionally, I'd even resort to a frozen diet meal with extra veggies mixed in, but the downside was most microwaveable diet entrees are loaded with sodium. In contrast, the new Medifast meals are touted as being low-salt. Beginning March 25, Medifast will offer its new Flavors of Home line at $29.70 for a box of six, which works out to $4.95 per meal. That's competitive with most take-out options and will be perfectly compliant with the plan. For people like me who have reached their ideal goal weight, the shelf-stable meals will be a life-saver for those busy days when I want to eat low-calorie and still get my veggies and protein in. If these meals taste half as good as they look on the box, I plan to keep a stash in my drawer at work. The three new Flavor of Home meals join two types of mashed potatoes to complete Medifast's mysterious 2014 product launch. One of the supreme ironies of recent times is that the low-fat diet trend has made Americans fatter. In what dieticians have dubbed the "Snackwell phenomenon," many reduced-fat processed foods are now loaded with more simple carbohydrates like sugar and high fructose corn syrup. The result: Obesity rates have doubled since the 1970s when this "healthy-eating" trend started. The connection between obesity and low-fat diets did not surprise some nutrition experts. "One of the most unfortunate unintended consequences of the fat-free crusade was the idea that if it wasn't fat, it wouldn't make you fat," Dr. Walter Willett told PBS a decade ago. "I even had colleagues who were telling the public that you can't get fat eating carbohydrates." "Farmers have known for thousands of years that you can make animals fat by feeding them grains, as long as you don't let them run around too much -- and it turns out that applies to humans," added the Harvard School of Public Health professor and author of Eat, Drink, and Be Healthy (emphasis added). Aside from the fact that most low-fat dieters compensate by eating too many carbohydrates, they are also notoriously famished most of the time. Fat is one of the best ways to satiate hunger, followed by protein. That's one of the reasons the Medifast diet worked so well for me. The Medifast 5&1 program allowed me to consume enough fat and protein to make me feel full, while limiting the high glycemic carbs that left me feeling hungry all the time. Before Medifast, I was like a novice cook trying to fill a colander with water. Even today, as I successfully maintain a healthy body weight after losing 35 pounds on Medifast, I reach for such high-protein, good-fat foods as hard-boiled eggs, nuts, hummus and avocados instead of cookies, bread, chips and pasta when I feel hungry. If I have a hamburger, I eat only half the bun or wrap it in lettuce. If I have pasta, I mix it with spaghetti squash at home or eat far less than what is served at restaurants. For me, empty carbs have become a condiment, a supporting actor in my healthier diet, which now stars proteins; fats and better carbs like vegetables, fruits and whole grains. Could Too Much Kale Be Bad For You? If the produce aisle of the grocery store were a beauty pageant, kale would be the reigning queen. So why has this vegetable darling recently sprouted devil's horns? Turns out too much of a good thing is ... well, a bad thing. The star of such popular dishes as smoothies, chips and salads can adversely affect your health if you eat too much of it. Even Dr. Oz seemed dismayed when a guest on his show explained that too much kale could not only cause hypothyroidism and kidney stones, but could also be risky for people taking antibiotics or blood thinners. Not ready to give up his kale altogether, Oz suggested some easy fixes for his fellow kale fanatics. To avoid hypothyroidism, he suggested cooking kale instead of eating it raw -- or eating it with seaweed, which has a lot of iodine in it. As for kidney stones, the best way to avoid them is to alternate kale with other greens, like spinach, lettuce and arugula. Finally, people on anticoagulants already know that foods high in Vitamin K can make their medication less effective so they should either avoid kale or eat it sparingly. Ditto for people on antibiotics. The moral of the story is to follow the advice of that ancient Greek media figure Aristotle, "All things in moderation," by not eating too much of any one food. 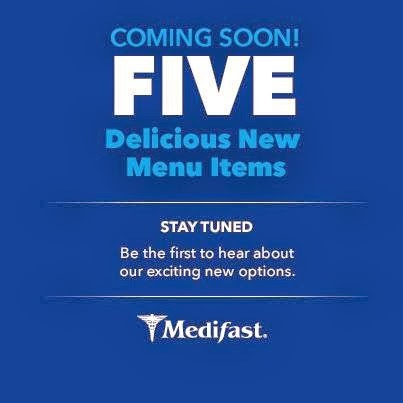 This week Medifast did a 6 o'clock news teaser, announcing via a graphic on its Facebook page that the company will soon be offering five new menu items. Since the only clues are that the meals are 1)exciting and 2)new, I have absolutely no idea what they might be. For those not familiar with the Medifast diet, a replacement meal can be anything from a chocolatey or fruity shake or bar to a crunchy snack or savory entrée. Medifast already offers plenty of shakes and bars to satisfy most taste buds; so I'm hoping the new menu items are in the snack and hearty meal product lines. From the Facebook shares I've seen, some people are guessing mashed potatoes and popcorn. Those items would be okay in my book since the potatoes could be morphed into a more elaborate meal with the addition of a low-fat Laughing Cow wedge, veggies and/or lean protein. Popcorn made right would be a welcome addition for us movie fans who smuggle in our snacks to avoid walking out of the theater as wide as the screen. I'd also like to see a chip-like option, something with the texture of Pringles and the flavor of Kettle Chips (I'm not asking for too much, right?). What I'd most love to see are some new hearty meal options. The new Medifast ziti marinara, which emerged solo on the scene last November, was a huge hit with me and other MFers. It has become my go-to lunch when I'm not on the go. But why stop with Italian food? How about a Mexican inspired hearty meal, like enchiladas, or a spicy curry dish? Or maybe go back to Italy and give us a pizza-ish flatbread meal? Whatever Medifast introduces is sure to create a lot of excitement among Medifast followers, including those of us on maintenance who still like to include one or two Medifast replacement meals in our daily diet or do a 5&1 or 4&2 program if a few pounds dare to creep back on. While exercising in front of the TV the other day, I caught an episode of Hoarding. Maybe the endorphins were making me light headed, but I had a light bulb moment that the accumulation of stuff the hoarders kept in their homes was a visible manifestation of over-consumption, like body fat. Without getting too much into the psychology of advertising, we live in a culture where we are convinced we never have enough. This is not a tin foil hat conspiracy theory, it's documented in every basic college advertising text book. The best way to market things to people is to persuade them their life is not complete without it. Before Medifast, I thought that unless I ate every treat put in front of me, I was depriving myself. Rationally, this made no sense. 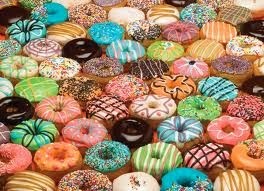 If I passed on a doughnut at work, I could always purchase one on my way home. The 65 cents would not make a dent in my wallet. Though my eating is now mostly under control, this mentality still haunts me when I'm shopping. If I see a coffee mug I like I feel compelled to buy it, even if I already have 17 others in my cupboard. 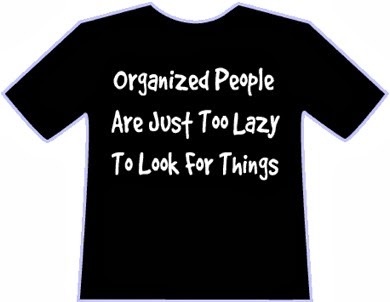 Though I have shed my excess body fat, I must now address my other fat issue -- too much stuff. Though decluttering experts advise that when you buy something new you should get rid of something else you already have, it is hard for me to part with something I own. Whether I like the way it looks, think I may need it someday or just have a fond memory attached to it, it's emotionally painful for me to get rid of my stuff. Fortunately, I am not even close to being one of those people on Hoarders, but unless I apply similar principles to thing consumption as I do food consumption, the potential is always there. My 30 pounds did not appear overnight, just as the TV hoarders' piles did not appear overnight. Both are the result of distorted thinking that this one thing/food/whatever will fill a void. Happily, the habits of health I am developing through the Medifast Take Shape for Life program can help me address other issues in my life that can manifest themselves in unhealthy physical ways -- whether it's too much body fat or mountains of useless stuff. I failed miserably as a vegan because I could not give up dairy cheese. 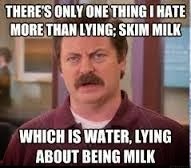 But I never completely bought back in to drinking cow's milk. Until recently, my favorite dairy milk alternative was almond milk, but that was before I discovered hemp milk. In case you're wondering if you can get high from hemp milk, the answer is no. Commercial hemp milk has no THC, the chemical in marijuana that makes you high, because it is derived from a different variety of the Cannibus sativa plant. So what is so great about hemp milk? For one, it tastes good. Hemp milk has the nutty flavor of almond milk, with an added bonus -- EFAs. These are the good fats Omega-3 and Omega-6, and in hemp milk they are perfectly balanced 1:3. Since we cannot create EFAs ourselves, we must get them from food -- and most of us do not get enough. Since I'm all about energy and brain function, not to mention skin health and good digestion, hemp milk is like a dairy-free milk panacea. Fortified hemp milk also contains lots of calcium, magnesium, iron, potassium, fiber, phytonutrients, and natural antioxidants like vitamin E.
I like hemp milk with blueberries and whole grain cereal, as well as in smoothies. With so much nutrition packed into a 70 calorie 8-ounce glass, I love the fact that hemp milk not only tastes good, but it's also good for me. Not surprisingly, Dr. Oz loves hemp milk, too -- especially for its memory boosting properties. So don't forget to try some hemp milk the next time you go to the store. What are the right reasons to lose weight? For me, it was regaining a healthy body mass index and looking better in my clothes. But for some women, the motivation to lose weight is a bit murkier. They are trying to sculpt their body into a figure made famous by fashion models and social media websites. These women are trying to create bikini bridges and thigh gaps -- two anatomical states that statistically only few women can achieve. In case you've been chilling on Mars this past year, a thigh gap is when you have a space between your thighs when you're standing with your feet together. Dr. Oz proved on his show this past week that only women with wider hips can sculpt their body to create this gap -- and even then they risk losing critical muscle tissue that is needed to maintain a healthy metabolism. Worse, even women who manage to get a thigh gap are often not satisfied with the width of the gap and continue striving to lose weight under the delusion this will make them happier. Dr. Jennifer Thomas, who studies women with eating disorders, told Oz the recent glorification of thigh gaps is dangerous. Both she and Oz ganged up on his other guest, Camille Hugh, who wrote a controversial book called The Thigh Gap Hack: The Shortcut to Slimmer, Feminine Thighs Every Woman Secretly Desires. Then there's the bikini bridge, a phenomenon that occurs when there is a space between one's bikini bottoms and lower abdomen. What started as an Internet hoax in which a group of Internet pranksters deliberately set out to create a fake fad is now an actual thing that can be found all over social media. In the case of weight loss, more can often be less. Losing weight to be healthy and have a normal body shape is fine, but you must know when to stop. To subsist on lettuce leaves and spend half your day doing squats after this goal is achieved can take you down the deadly path of an eating disorder.